I am a big fan of using oils for stretch marks. Fact. I'd love to say that my body is a stretch mark free zone but that would be a lie. I can't even say that I didn't have any until I had kids, I had them WAY before! One thing I can claim though is to not have had one single one across my tummy after my first pregnancy. The sad news though is that the second pregnancy didn't take any prisoners and I have a few on my tummy now. But rather than feel hung up about it like I used to about the ones on my thighs, I actually don't mind so much as I have my beautiful boy to show for those 'battle' scars! 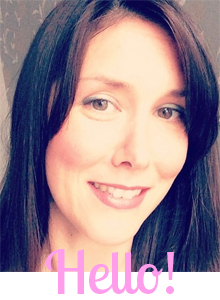 I love using oils as I think they help to keep my skin supple and help to make it look more youthful. Anyway, moving on. I was asked to try two products from the ethical skincare range Shea Mooti and I was really up for it as I LOVE body care products and it makes a change to receive something for me. Before children, without fail I would moisturise my whole body EVERY DAY. Now with two children, time spent on myself and my body is limited and I don't lavish enough attention on my poor weary, clapped out shadow of my former self! I tried the Belly Rub Stretch Mark Oil and the Soothing Leg and Foot Cream and I really can say that I would buy and use them. I have a preference for the Stretch Mark Oil as I loved the scent of it and I really do think that it helps my skin as it shrinks back to size. 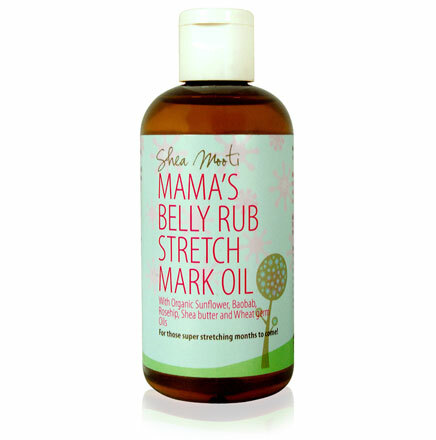 The Stretch Mark Oil is most often used by the mum to be and I'm using it post baby but I would say that it's just as vital to be kind to your skin when you've had the baby as it is pre baby. The oil absorbs nicely, it's non greasy and doesn't sit on top of the skin. The Leg and Foot cream has such a lovely texture and it feels great on the skin. I wasn't as keen on the scent for this product, it wasn't as delicious smelling as the stretch mark oil but I think this might be due to the anti-septic oils contained within the product. Again this is a product that would be well suited to a mum to be as it is described as "Therapy for those hard working legs carrying a heavy load" - I would say that Noah is definitely a heavy load (20lbs at 4 months!) and so my legs are working just as hard now as when I was pregnant and so deserve to be treated to this cream! Both of these products are packed full of wonderful ingredients and all Shea Mooti products contain Shea Butter. This brand is a wonderful example of 'natural' skincare. Try it yourselves! At the moment they have a discount code for first time users to get 10% off their first order. Quote SHEA131 at the checkout. Like Shea Mooti on Facebook and follow on Twitter for all updated news on their products! I was sent both of the products mentioned in this review for free but my views are honest and my own. Sounds lush. A big fan of any indulgence!